The nights are drawing in, the temperature is dropping and all you want to do is hibernate under a blanket with a big bowl of comfort food. 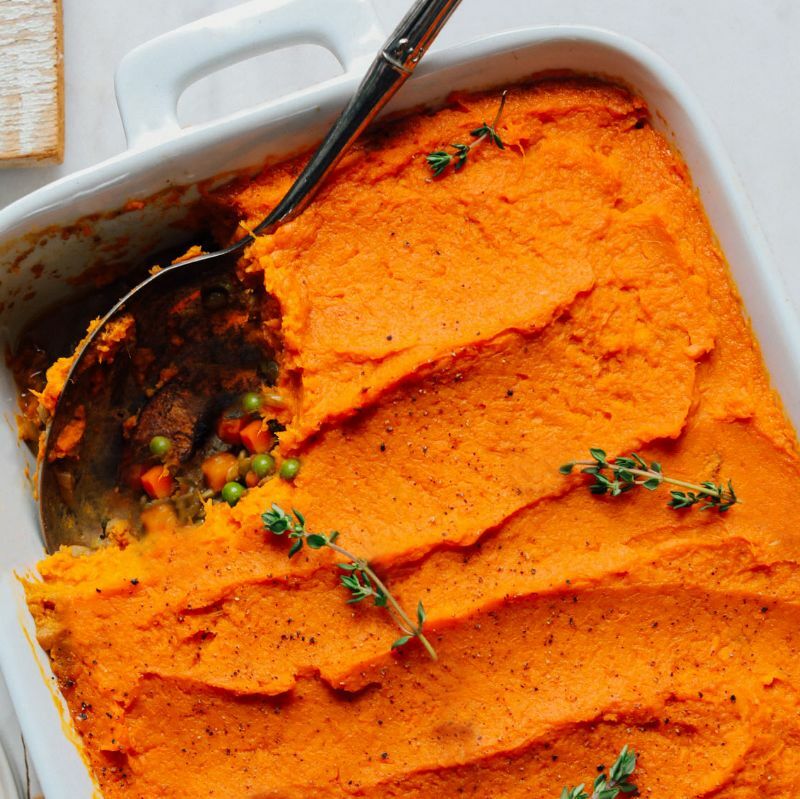 This meat-free shepherd’s pie is almost guaranteed to hit that comfort spot, and is both warming and satisfying, whilst also being extremely nourishing and full of goodness. The addition of the sausages is a game changer and adds real depth and texture. 1. Start by peeling and chopping the sweet potatoes and putting them on the hob to boil until soft – 15 minutes is usually long enough. 2. Next, preheat the oven to 200°C (180°C fan) and pop the sausages in to cook for 10-15 minutes, or follow the instructions on the packet. 3. Heat the oil in a large saucepan or wok and sauté the onion, garlic, leek, carrots and parsnips for a few minutes until soft. Add the chopped tomatoes, tomato puree, Worcestershire sauce, ketchup, balsamic vinegar, herbs, spices and pepper, then add the vegetable stock and simmer for 15-20 minutes on a low heat. Add more liquid to loosen during the cooking process if needed. 4. Add the peas a few minutes before removing from the heat and ensure they are fully immersed in the sauce. 5. Once the potatoes are boiled, mash them with the milk, margarine and season with salt and black pepper to taste. 6. Remove the sausages from the oven and cut each in half lengthways so you now have 12 ‘half sausages’. 7. To assemble the pie, start by laying 6 of the sausage halves on the bottom of a glass lasagne dish (or whatever dish you are using), spoon over some sauce, then layer the other 6 sausage halves on top. Spoon on the remaining sauce, then top the pie with the sweet potato mash, ensuring the whole pie is fully covered. You could garnish with your favourite herb – perhaps rosemary or thyme. 8. Transfer to the oven and bake for 20-30 minutes until the mash is starting to crisp and the sauce is bubbling. Serve with a big side of seasonal greens.